To help support the ongoing work of the PMA Educational Foundation, you, your company, foundation, or organization can invest in the endowment or annual giving campaigns at several levels. Benefits vary by giving level and can include recognition on the PMA/PMAEF website, recognition on booth signage at FabTech, the Annual Meeting, and acknowledgment of your gift from the podium at District meetings and events. Georgia: A full and fair description of our programs and our financial statement summary is available upon request at our office and phone number indicated above. Maryland: For the cost of copies and postage, from the Office of the Secretary of State, State House, Annapolis, MD 21401. Mississippi: The official registration and financial information of Precision Metalforming Assoc. Educational Foundation may be obtained from the Mississippi Secretary of State’s office by calling 1-888-236-6167. Registration by the Secretary of State does not imply endorsement. 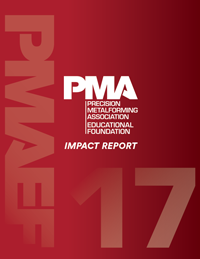 Pennsylvania: The official registration and financial information of Precision Metalforming Assoc. Educational Foundation may be obtained from the Pennsylvania Department of State by calling toll-free, within Pennsylvania, 1-800-732-0999. Registration does not imply endorsement.